Wait...there is NO dust in my Studio Closet, so I guess I really can't say that. However...I have neglected her for some time. No excuses...let's just move on! 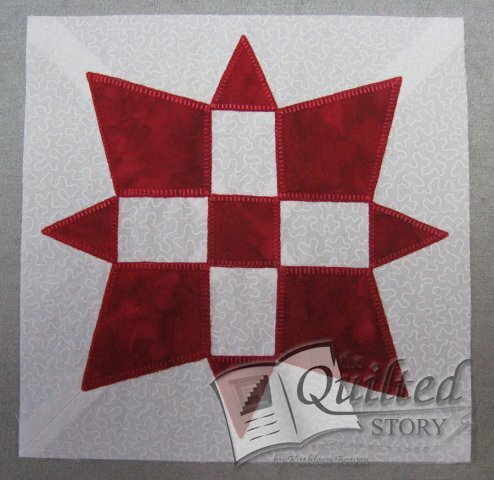 Here is Block A-13 called Starlight-Starbright and once again I just had to shake it up a bit! First, I did go ahead and cut a larger white background square measuring at 8". I then cross cut it from corner to corner, in both directions. I then used a 1/4" seam allowance and sewed the pieces back together to create this background pieced look. I love this little quick technique and it plays a double duty as a reference point for setting on the rest of the block...which is the RED section. At this point please visit my Gallery of pictures and click on the Dear Jane Collection and you will re-familiarize yourself with the fact that my Dear Jane is A Rebel in RED! Now...simply because I CAN...I took the pattern and made an Applique out of it...using Heat and Bond Lite on the backside of the fabric. Using the seam lines as my reference points, I pressed the pieces in place making sure that all the edges touch the "neighboring" piece...this way I could machine applique the edges with a matching RED Embroidery Thread in a continuous sew. Block A-13 is the last block in Row A and it has 13 pieces...using the method I did of Machine Applique. Ahhh...I feel motivated...let's make some more blocks. I must apologize for my week long absence from little Quilty Blog...it's just been darn crazy here! I made this Beautiful Deep Dark Chocolate Cake with a Hint of Coffee to make things all better between us...OK? Alright...so I'm simply exaggerating to say the least...but, I really did make this cake...only I made it for my new Quilters Club that I organized...you know...just because! I have now lived in the Upstate of South Carolina for almost 4 years and I was really getting tired of being told that there was NO room for me in any existing clubs in the area. So just like my Momma taught me...I started my own! I'm a real fire starter here! LOL! 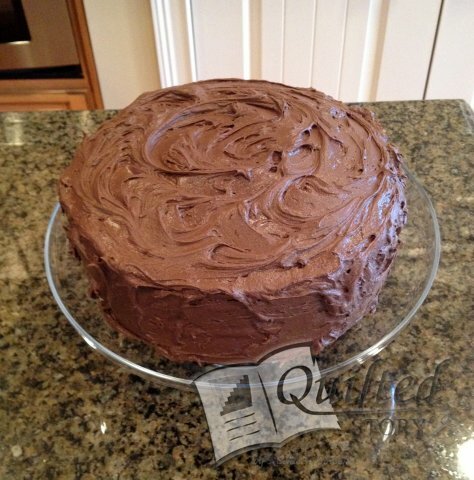 The first meeting was held at my house and I felt like baking something yummy to put everyone in a Happy Happy Mood...nothing does that better than some yummy Rich Chocolate Cake. It's Studio Thursday...what does your Work Space look like in your Studio? Mine's a bit messy...well maybe not messy, but cluttered. But the OCD in me is saying...clean this up and put stuff away! Since I always do what I'm told...I may or may not have compulsively organized the whole room. 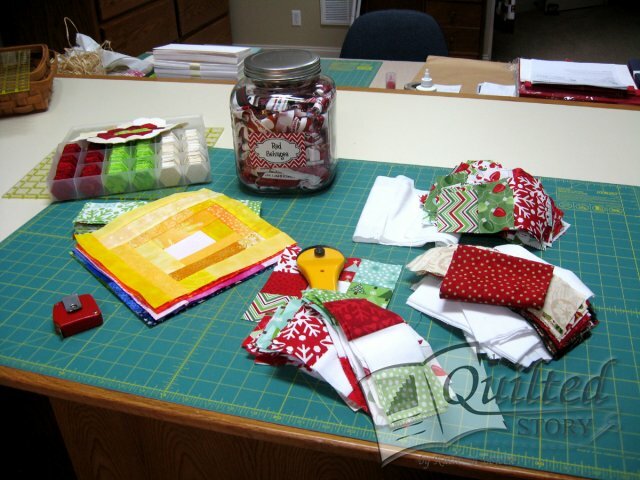 As I continue to upload the many Quilts and Projects I have done over the last few days, weeks, months and even years I am amazed just how many are sitting in my Phoca Gallery just waiting to be blogged about. Anyone else out there a little behind on the blog posting of important pictures? Here's one my life's Proudest Moments as it's a Comfort Quilt for a Cancer Patient. His name was John...a Special Man who lost his short battle to Cancer. 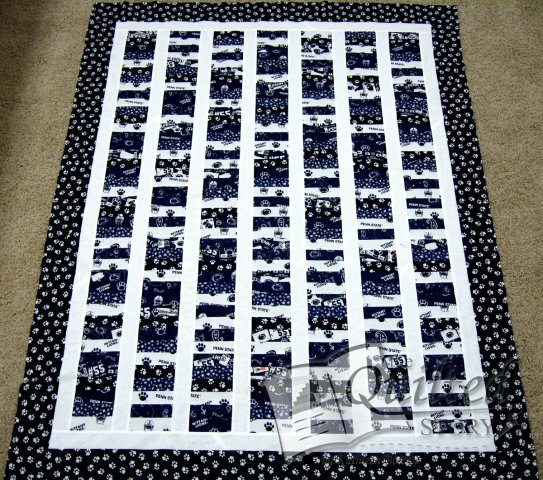 He was a major Penn State Fan, so most of the fabrics used were of a Penn State print. I worked quickly so I could get the quilt delivered to him during his treatments...I was assured he loved it dearly. Just like the many quilts I have made over the years for seriously ill adults and children...this quilt was an absolute pleasure to make. I quilted it with repetitive lines from top to bottom and it was so simply using my Walking Foot! Christmas Presents are still being revealed here at The Quilted Story Studio...and this pair of Patchwork Stockings is no exception. These adorable Stockings, complete with Machine Embroidery Appliqued names were made about 3 years ago for my in-laws and I just realized I did NOT post or blog about them. It's OK...because they are still CUTE! I really think most people like to see their names on the cuff top of their stocking so I just eliminated the portion of the pattern that included a Paper Pieced Cuff and replaced it with a plain background piece so I could Embroider Applique the names onto that area. 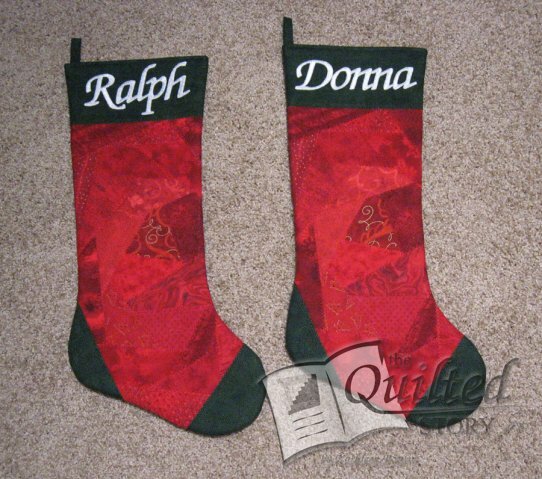 I made the two stockings using an identical placement of scrappy Reds and Greens so that they would match each other...except for the actual names. How do you all like them? Let's see what else I can dig up from the Phoco Gallery of un-blogged about Christmas Gifts!